The Family Compact is the epithet applied to a small closed group of men who exercised most of the political, economic and judicial power in Upper Canada (modern Ontario) from the 1810s to the 1840s. It was the Upper Canadian equivalent of the Chateau Clique in Lower Canada. It was noted and reviled for its conservatism and opposition to democracy. Upper Canada did not have a hereditary nobility. 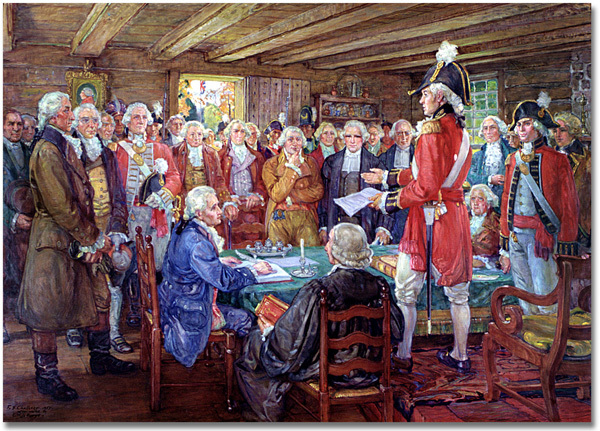 In its place, senior members of Upper Canada bureaucracy, the Executive Council of Upper Canada and Legislative Council of Upper Canada, made up the elite of the Compact. These men sought to solidify their personal positions into family dynasties and acquire all the marks of gentility. They used their government positions to extend their business and speculative interests. Legislative Coucil of Upper Canada: William Osgoode, William Robertson, Alexander Grant, Peter Russell, Richard Duncan, Robert Hamilton, Richard Cartwright, John Munro. The Family Compact exerted influence over the government through the Executive Council and Legislative Council, the advisers to the Lieutenant Governor, leaving the popularly elected Legislative Assembly with little real power. As became clear with Lt. Governor Sir Francis Bond Head, the influence of the Family Compact could be quite limited as well. Members ensured their conservative friends held the important administrative and judicial positions in the colony through political patronage. The centre of the Compact was Toronto, then called York. Its most important member was Bishop John Strachan; many of the other members were his former students, or people who were related to him. The most prominent of Strachan’s pupils was Sir John Beverley Robinson who was from 1829 the Chief Justice of Upper Canada for 34 years. The rest of the members were mostly descendants of United Empire Loyalists or recent upper-class British settlers such as the Boulton family, builders of the Grange. A triumvirate of lawyers, Levius Sherwood (speaker of the Legislative Council, judge in the Court of King’s Bench), Judge Jonas Jones, and Attorney General Henry John Boulton were linked by professional and business ties, and by marriage; both Sherwood and Boulton being married to Jones’ sisters. Collectively, their extended family (if we include the Robinsons, and James B. Macaulay, Boulton’s former clerk) comprise three quarters of the “Family Compact” listed by Mackenzie in 1833. The primary opposition to the Family Compact came from the reform movement led by William Lyon Mackenzie. His ability to agitate through his newspaper The Colonial Advocate and petitioning was effective. Speeches and petitions led directly to the redress of grievances in Upper Canada that otherwise had no means of redress. 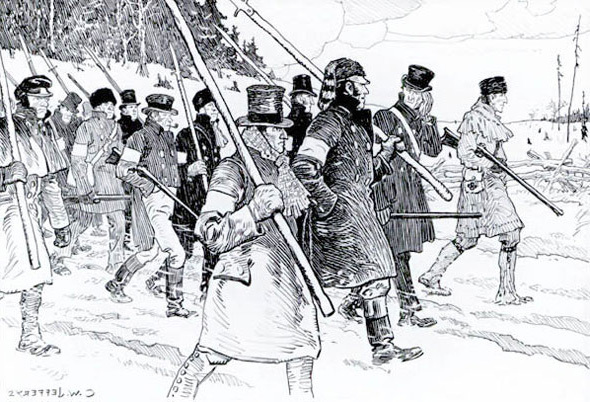 Mackenzie’s frustration with Compact control of the government was a catalyst for the failed Upper Canada Rebellion of 1837. Their hold on the government was reduced with the creation of the united Province of Canada and later the installation of the system of Responsible Government in Canada.